1. What lodging options do you offer to arrange for students? Shared apartments with 3 or 4 rooms (single, double or triple), single apartments for 1 or 2 persons, homestay, hotels and hostels. 2. Are most home stays and your other lodging options (if any) within walking distance of the school? If not, how long of a bus or subway ride and what are the costs? Apartments: Two apartments are directly in front of the school, the apartments furthest away from the school can be reached within 20 or 30 minutes walking or 10 minutes by bus. Families: Some are in the school’s neighbourhood, others a little bit further away. We always intend to search first families who are living nearest to the school. Nevertheless, during summer time (high season) we have to accommodate our students also in families living further away. The families living furthest away of our school can be reached within 20 minutes by bus. 3. Are there other students living with same host family? How many? This depends on how many rooms the family rents out. Some rent out just one single room, so there is only one student living with the family. However, the majority of the families rent out more rooms, and also work together with other schools, not just with our school. That’s why normally more students are living together in one family. 4. If the student chooses a shared room, does he/she share room with another student or member of the family? Is the shared room option only available for students travelling together? The student will share room with another student, but not with somebody from the family. The shared room option is also available for students who are travelling alone. 5. How many meals are provided daily in a home stay? Any meals at other accommodations? 6. Can entire families stay at the same home stay or other lodging? In general this is possible, but it depends, of course, on the availability of rooms/season. 7. Do you have any accommodation with private bathroom? We have the option for a private bathroom in 1 apartment, the “own apartment” and of course also in hotel. 8. Is there an accommodation discount for young children? If so, at what age does a child have to start paying full price? No, there is no discount for the standard courses. Nevertheless, we offer the Junior Programme, which includes accommodation in family. This way, the accommodation results cheaper. 9. When should the student arrive to and depart from the accommodation, before he/she has to start paying for extra days? What is the price per night for additional nights? Is there any problem arriving a few days earlier or staying a few days longer? 10. Are your accommodation options available to travel companions who are not studying? Is there any extra charge? Yes, travel companions can also use our accommodation facilities. However, they have to pay a supplement of 90 EUR/week. 11. Is laundry service included? If not, what do students usually do? In all our apartments there is a washing machine, in families students have the right to use the washing machine once a week. 12. What is a standard equippement of a room in an apartment/homestay? Usually in each room there is a bed, a wordrobe, a table, a chair, a bedside table, a lamp and a wastepaper basket. Moreover in the living room there usually is a TV. Some of the apartments and homestays have a telephone and Internet access. Our students are mostly from Europe, but we are expanding steadily and trying to catch more and more clients also in other parts of the world, as, e.g., in China, Japan, and the United States. At our school we welcome all different types of students: We have a lot of students who want to learn the Spanish language just for themselves, others, who study Spanish in their home-country and want to increase their knowledge, students who need to speak Spanish because of their job, etc. 3. How many students do you have per year? We welcome approx. 800 students per year. During the summer time there are between 80 and 120 students at one time, during spring and autumn 30-60 students and during the winter time 15-40 students. Málaga ¡Sí! is located in one of the city's most attractive and fashionable areas in the eastern part of the city, Pedregalejo which is a very popular neighborhood. The school is housed in a beautiful mansion, built in the harmonic Andalusian style. You can study in pleasant environment with generously dimensioned classrooms. The building is surrounded by an impressive garden filled with yucca palms and lemon trees, which contribute to a relaxed atmosphere and provide appreciated shade during the hot summer months. After a day of intensive studies, you can relax with a cooling dip in the school's own swimming pool, and just two blocks away the sea and the wide expanse of beach offer sun and bathing. Málaga ¡Sí! is a high-quality learning institution emphasizing training suited to individual needs. All our teachers have long experience and training in teaching Spanish to foreign students. 5. Your maximum capacity per day or per study session? 6. Please describe the area where your school is located. Málaga ¡Sí! is located in one of the city's most attractive and fashionable areas in the eastern part of the city. The Pedregalejo district grew up in the 50's and became a favourite refuge for wealthy families who were looking for a quiet atmosphere far away from hectic urban life and city centre noise. Pedregalejo is about 3km from the city centre, which can be easily reached by taking a direct bus. There is a bus stop right in front of the school. Málaga ¡Sí! is less than 100 meters away from the beach. On the beach promenade you will find many bars and authentic fish-restaurants. 1. What is the youngest student accepted into the regular program? All students who are younger than 18, have to provide us with an authorization of their parents. 2. Do you have special programs for children? Short description? Cost? All activities are accompanied by a monitor. 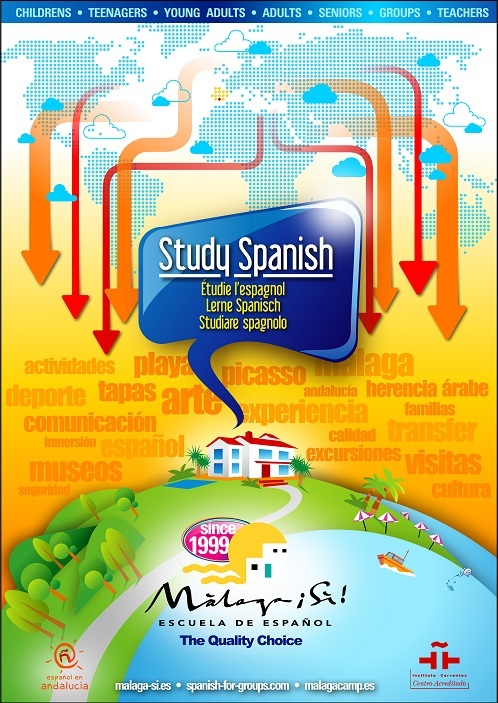 - To learn Spanish while visiting and enjoying Malaga. - To enhance the teenager’s ability to handle daily tasks without the support and protection of their parents. - To make new friends and built social relationships. - To study and enjoy in direct contact with nature experiencing a new adventure every day. - To learn the basis of the team player in the classroom and with the sports and cultural activities participation. - To enrich their personal assessment with a memorable intercultural experience. 3. Do you have any childcare for children that are not studying? What is it (mother of the house, special nanny, day-care centre, etc.)? What is the cost? No, we don’t offer childcare facilities for children that are not studying. 1. Maximum number of students per class? 8 students, but the school reserves the possibility of increases up to 12 students in cases of organizational necessity. 2. Average number of students per class? 3. Number of different language levels? 4. Text and method used? Our teaching material is recognised by the CERVANTES INSTITUTE, all our teachers are university trained and are experienced in teaching Spanish to foreigners. Methodology: close collaboration between teachers and students, our teachers are always available for our students; balance between in-depth studies of the structure of the Spanish language and its application in concrete situations; we provide after-class-activities so that the students continue learning Spanish outside the classroom. 5. What do you do about academic credit? Do you have any special relationships with colleges and universities? Do you have a list of colleges that frequently grant credit for your program? We are recognised by the CERVANTES INSTITUTE, CSN (official Swedish institution that provides loans to Swedish students), and the Chinese Embassy in Madrid. In addition, we are authorised to offer “Bildungsurlaub” to German students. We are a member of ACEM, EEA, FEDELE, ELITE, CECE, and the Chamber of Commerce in Málaga. Until now, we don’t receive credits. 6. Do you offer 1-on-1 instruction? Is there anything that we should know regarding 1-on-1? (Some schools that mainly offer group instruction can only provide private tutoring AROUND their regular program. For ex. 1 hour in the morning, 1 hour at noon and 1 or 2 hours in the late afternoon. Is there are any similar restrictions at your school?). Yes, we offer also private tuition. Our students can book the following options: Private tuition with 4 lessons a day, with 6 lessons/day, or single private lessons. In addition, we offer a combined course with 4 lessons in group and 1 private lesson per day. According to the level and the number of students, classes can take part in the morning or in the afternoon (if someone has private tuition with 4 lessons a day e. g, these 4 hours altogether can be in the morning or in the afternoon, but not 2 in the morning, 2 in the afternoon). There are no such restrictions as mentioned above. 7. Do you feel comfortable with highly advanced/superior levels? What has your experience been so far? Do you feel more comfortable steering advanced and superior levels to private instruction? 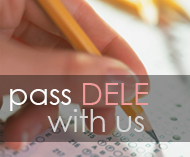 We feel comfortable with all our students whether they have an advanced level of Spanish or are beginners. 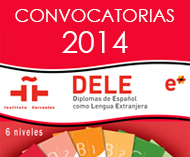 In addition, we offer courses for students who will be teachers of Spanish in their future. In the last 1,5 years we have trained about 200 future teachers. 8. What time should the students come to school the first day? 9. Do you have a placement test? When? What type of test? Yes, we have. The placement test takes place on the first day of classes at 8:30. It´s a written test that includes grammar questions and text production. On the first day of classes you will join your course at 10:15 or later, depending on your schedule. Please be advised that if your course starts usually at 8:30, on the first school day you won´t take part in the first 2 classes. 10. Do you have any information prior to the arrival and on the first day of school? When? First of all, we send to all our students a pre-departure package with information about the school, accommodation, first day of class, payment, the city and the school’s neighbourhood, important phone numbers, etc. The first day of class starts with the placement test, and then there is a short presentation of the school, its facilities, its team, the city, etc. We also inform our students about our activities programme, about where they can buy bus-tickets, where they can find a pharmacy or where to go or who to contact in case of an emergency. 11. How are classes scheduled? If not always the same please include a sample itinerary. Your classes may take plase either in the morning or in the afternoon. 12. How are teachers scheduled? How often does the student change teachers? Every student has one teacher in grammar, and another one in conversation. Changes are due to organizational needs of the school. 13. Does someone take the student to school the first day? Who? No, in general, our students have to find their way on their own. However, this is no problem because they receive a map indicating the exact way from their accommodation to the school. Some families are used to take the student to school the first day. We offer also programmes, individually tailored for groups of students. If they live with a family, the family picks them up at school on their arrival day and takes them home, explaining them the way to school. 14. How many teachers are there in your school? There are around 15 teachers who colaborate with Málaga Sí during the year. 1. Weather? How much rain during rainy season (afternoon, evening)? When is the weather the best? What are the temperature fluctuations throughout the year? 2. Best time to study based on cultural events or festivals? Short description of these events? Semana Santa (Easter): Every year, during the Passion Week in Málaga takes out to the streets a real festival: processional thrones carrying images that are swung all along the entire route, thousands of penitents lighting and giving colour with their candles and robes, processional marches, as well as aromas of incense and flowers filling the air as the processions pass by and thousands of people crowded to see and applaud their favourite “ tronos” (floats, thrones). The Holy Week in Málaga is very different to that celebrated in other Andalusian or Spanish cities, and those who go to Málaga for the first time will be surprised, as the Passion Week there is not lived with meditation and silence, but it is full of happiness, noise, cheer, spontaneous saetas (flamenco verses sung at the processions) and applauses as the images pass by. Málaga’s Summer Fair (15th of August): The summer festivities in the city have their roots in the commemoration of the incorporation of Málaga to the Castillian crown of the Catholic Monarchs. Málaga´s August Fair has come to the present day as a Grand Summer Fair that is open, cosmopolitan and international, all of this reflecting the character of the capital of the leading tourist area in Europe: the City of Málaga as the key center of the Costa del Sol and its metropolitan area. Today the fair is more than ever before, a sign of Málaga´s progress. This finds its expression in the sum of money which is spent by the City Council for the festivities. Every year, people of all around the world are visiting Málaga when the famous fair is taking place, to take part in this spectacle. 3. Important advice (visa, insurance, safety, etc.)? Citizens of the EU do not need a visa to enter Spain. A valid passport or identity card is, however, necessary for all visitors. If you are an EU citizen, and you intend to stay longer than three months, you need to apply for a residence permit. You can arrange it at the nearest police station by filling out a form. You need to bring your passport and an enrolment confirmation from the school. Málaga Sí strongly recommends that you take out an extensive international health and travel insurance with a full risk cover. We can arrange it for you as well. If you are an EU student and an EU citizen you have to bring the European Health Insurance Card (EHIC) to receive first aid assistance in a public hospital. Nevertheless it is crucial that the school receives detailed information about special health conditions that you might present (like allergies, diets etc). Apart from this, the school has contracted civil responsibility insurance for all the students inside the school building, its surroundings and during excursions and activities organized by the school. In addition, our school and its staff have past the legal standards regarding job hazards. Our students will enjoy a safe and caring environment during their holidays, as our experienced staff and families provide guidance and supervision at all times. An experienced monitor will take care of all the students´ needs outside the classroom. Our professional team of monitors will accompany the students throughout their stay and be available for all questions the students have. Our host families are extensively prepared and experienced in receiving young students from outside Spain. They are all thoroughly vetted by the school and people of great confidence who enjoy opening their doors to share the local customs and culture with young students. To start the course and to participate in all the activities and excursions, all the students enrolled in this course must bring an authorization as a minor, signed by their parents. In addition, we need to know the exact hour at which the students have to come back home in the evening – a document also confirmed by the parents. 4. Does the school organize afternoon activities? What kind of activities? How often? Is this included in the program cost or is there an additional cost? How much? Are they conducted in the language being taught or in English? Can a student's travel companion participate? These parties are designed to welcome the new students and to make it easier for them to get into contact with the existing group of students. During this party the students can talk, dance, eat and drink (non-alcoholic beverages) – in short, they enjoy their time and have fun. The party takes place every Wednesday at our school (either inside or outside in the garden). These parties are celebrated in the evenings. In the first case, a group of dancers will come to the school, and the students will be able to participate in a real flamenco-spectacle. The students can take part in the dancing, they can eat, drink and enjoy the evening with their classmates. For the BBQ parties, the school prepares meat, sausages, “pinchitos”, “chorizo“, and drinks either in the School’s garden or at the beach. In addition, some evenings, we prepare the typical Spanish Paella together with the student´s. Later, we sit together in the school´s garden and enjoy the dinner. In the cooking lessons the students learn how to make a Spanish omelette, pepper’s salad, or other Spanish specialities. Everyone participates in this interactive situation. When the food is done, all of the participants are eating together – which is the perfect atmosphere to introducing new vocabulary to the students and letting them talk with the teachers in a relaxed environment. One of the activities oriented to get to know the Spanish food tradition is the “Tapas” evening. The students visit with our staff typical tapas- bars, and are able to taste various Spanish specialities in a nice environment. Apart from the “tapas”-evening, there is another informal dinner with the teachers and the school’s staff, where everyone talks Spanish. 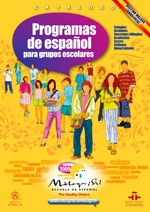 This activity is very important for the students´ approach to the Spanish culture and language. The school offers, included in the course price, one cultural visit a week with a guide. The students will visit the Cathedral, Victoria’s Sanctuary, the Santiago church; the museum of fine arts, the Picasso museum, the Archaeology museum, the Town Hall museum, Gibralfaro and the Alcazaba Arabic castles, as well as “La Concepción” – a botanical garden. Once a week we show a Spanish movie in school. Some movies are oriented to show the past and present situation in Spain, others are good commercial movies in the Spanish version. The Sports Club “El Candado” has a tennis school with individual, and group classes. Students who wish to learn how to play golf or improve their skills can practice this type of “Costa del Sol“-sport at the club “El Candado”, too. During the summer the club offers swimming courses every day. During the weekends, as well as in the evenings from Monday to Friday, the sports club offers trips through the countryside. In addition, students, who are interested, can take horse riding classes. There are excursions every weekend to different Andalusian cities. The meeting point for the excursions is very close to the school, the apartments and families. The excursion price includes bus transport, tickets for visiting museums, castles or monuments, as well as the cost for a monitor and an official guide during the visits. “Parlamento Andaluz”, Bridge of Alamillo, River “Guadalquivir”, “Plaza de América”, “Plaza de España”, Cathedral, “La Giralda”. “Punto de Europa”, Cave of San Miguel, monkeys of Gibraltar, free-time in town. For the price of 190 EUR our students can book at our school an excursion to Morocco. In this price everything is included (bus, ferry, meals, hotel, guides, and travelling insurance). On the Blog of Málaga ¡Sí! you can find every week an activities-plan from Monday till Sunday where we give some opportunities for activities and excursions. These activities and excursions are in general in the centre of Malaga and in the province Malaga. In the planning at every activity there is some information showed, e.g. the time, the price, and the location of this activity. There are different activities which we offer every week, like Fuengirola´s Zoo, Málaga Tour by bus, different types of Flamencoshows, and horseriding. Along the coast, there are several amusement parks. During the summer, Málaga ¡Sí! recommends a visit to one of them on the weekends. All information regarding to transport, tickets, timetables, and discounts are available at the school´s administration. 5. Does the school organize weekend trips? How often? Where are most common destinations? Can you include a short description of these trips? Does anyone from the staff go along? Are they conducted in the language being taught or English? Cost? Can a student's travel companion participate? Yes, we organize weekend trips (for details see 4.). No, in general, staff-members don’t accompany the trips, but an official guide. Exception: Junior Programme: All excursions and activities are accompanied by a monitor of our school. Excursions are conducted in Spanish/English. Of course, travel companions can also participate. 6. Do you arrange for volunteer work (or internship placements)? How does it work? What kind of volunteer work? Do you require that the person studies at your school for a number of hours first? Is it possible to participate in volunteer work arranged by you, but not having to study at your school. If this is the case, do you charge a placement fee? Yes, we arrange internship placements for Spanish students as well as for foreign students. Internships of Spanish students are paid, those of foreign students are not paid, but we offer them a discount on accommodation. As we collaborate with a lot of universities, we constantly receive applications of students from many different countries. Fields: Administration, logistics, marketing, translation, informatics, housing. Interns don’t have to study at our school before realizing an internship with us. Nevertheless, we offer a special course – “Intensive + Work Experience”: Before his/her internship the person participates in an Intensive Course (20 lessons/week). After the course the person can work either with us or we search for an internship-vacancy in another company. The enrolment fee is 300 EUR. 7. Can you please include a list of hotels (from basic to luxurious). Cost, address, fax, phone, email. Do you make reservations for students that choose to stay in a hotel? We make reservations for the students who choose to stay in a hotel. Please take into consideration that you have to inform us in advance, especially during high season. 8. Are there any Sports/Gym facilities nearby? 9. Do the students have access to e-mail at the school? What is the cost to send and receive? If not available, is there a service or internet café nearby? Cost? We provide our students with free access to the world wide web. In addition, there is a wireless internet connection available free of charge. 10. If offering airport pick up - Who does the pick-up? Please include telephone number for this person/company in case of last minute flight changes. Yes, we, on our own, offer also airport pick-up service, meaning that there is no other company involved. If there is a last minute flight change, please call the school’s administration: + 34 952 29 47 00 or the Málaga ¡Sí!-Emergency Number: + 34 696 279 816. The school is opened the whole year, except bank holidays. All courses start every Monday. 12. What are the dates when the school is closed including breaks such as end of the year? Bank holidays 2012: 02.01, 06.01, 27.02, 05.04, 06.04, 30.04, 15.08, 20.08, 08.09, 12.10, 02.11, 07.12, 08.12, 25.12. 13. Why is your program better than others? - At Málaga ¡Sí! all courses start every Monday all year long. - We offer our students excellent facilities, an international environment, and various leisure activities. - We offer quality products at excellent prices. - Our organisation is oriented to the students´ satisfaction and pays attention to their individual needs. - We are one of the few centres in our location associated to the Cervantes Institute. - Málaga ¡Sí! is member of city, region and country associations in order to promote the Spanish language worldwide. - We pay great attention to product variety, which means that we offer a wide range of special courses, designed to different markets or segments like adult-, teenager-, and price-sensitive courses, as well as courses for students from countries with different summer holidays. - We offer courses of 6 different levels from beginner to mastery, in accordance with the European Union system of the Common European Framework of languages. - All our teachers are experienced and university trained. - The maximal class size is normally 8, the average size is 4 students. Only during summer, the maximum number of students can be 12, the average one 6. - Málaga is a city full of life, culture and attractions. - At Málaga ¡Sí! you study in an international atmosphere. - We have over 13 years of experience in the language-travel market. - Last minute bookings are accepted. - We guarantee all our clients a reply to inquiries and a confirmation of their booking within 24 hours. 14. What are your opening times? Málaga Sí is open from Monday to Friday from 8:30 to 18:30 and on Saturdays from 10:00 to 14:00. 15. In what language can I get attended at your school? The staff of Málaga Sí speaks 9 different languages: Spanish, English, German, Dutch, Swedish, Polish, French, Russian and Latvian. 16. How do you evaluate the satisfaction of your students? On the last school day students are asked to give us their feedback on Málaga Sí´s performance by filling in an evaluation form. The evaluation form allows you give your opinion about such aspects of your stay as: course, teachers, accommodation, activities and administrative staff. According to the evaluation forms the satisfaction rate of our students is of 96%.